It's time for a CELEBRATION!!! Lollipop Crafts is celebrating their ONE YEAR BLOGAVERSARY and you are sweetly invited to join the fun! First of all, we are back from summer break with our weekly challenge. The theme this week is CELEBRATION! Create a card/project with a celebration theme (ex. birthday, anniversary, wedding, new baby, graduation, etc) We all have something to celebrate right? 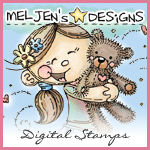 It is the first challenge of the month and that means we are sponsored this week by Meljen's Designs. One lucky random challenge player this week will win a fantastic prize. Be sure to link your creations with InLinkz on the LC blog for a chance. Check out the challenge rules too! Secondly, it wouldn't be a celebration without some FUN! Join in on our Anniversary blog hop! You have until tomorrow (Tuesday at midnight PST) to visit and comment on each DT member's blog. Make sure you visit each of us because their are hidden prizes (the DT doesn't even know who has the prizes). Winners will be announced on Wednesday. List of blog hop sponsors can be found on the LC blog and the master blog hop order is there too! You should have arrived here from AGNES' blog. If you hopped here by chance, please head over to Lollipop Crafts and begin your journey there. Now it's time for you to hop on over to KRIS' blog and leave some sugar!! That is definitely a cool dude birthday card!! Love the personalization!! This is "rockin" Love the image!! oh I think you did an excellent job creating this card Mimi!!! perfect image for this guitar paper!! Fantastic card!... is a perfect cad for a boy. Cool little boy card Mimi! I love that guitar! Nice personalization! He's going to love it! What a cute card for a boy. I love that paper with this image! I want that paper lol, my son plays the electric guitar and this would be fabulous for a card for him. What a great guy card Mimi! You always do such wonderful work! :) Happy b-day to LC! Love the "guy" card and layout. this card is really cute! love that image! Very pretty card! I love the image. What a fun "dude" card!!! This guy reminds me of my 21 yr old. How fun! Boy cards always seem more difficult but I agree the 10-14 is the hardest! I think your card is perfect, great paper and the image is cool! Awesome boy card Mimi!